Punch “R” for rooftop in the elevator of the One West Las Olas building and the doors will open seven floors later onto a dreamy, open-air patio covered in Astroturf and vine-wrapped columns complete with a revered team of bartenders ready to dare you with exotic mescals, seasonal cocktails, and exciting bar bites. Order the Filthy Phil, an inventive take on the Old Fashioned with tequila instead of bourbon, and sip it while taking in Fort Lauderdale’s dramatic downtown skyline. 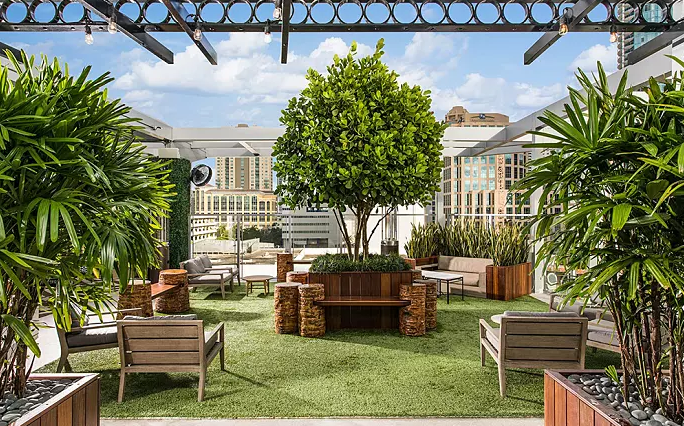 “In order to be a proper rooftop bar, you need a killer view, and this definitely has it,” says Alex Daranyi, a Rooftop bartender. © 2019 Rooftop. All Rights Reserved.